November 2012, Saudi Arabia – Ninety kilometres from the Red Sea lies the birthplace of Mohammed, the prophet of Islam: Mecca. And in the heart of the Holy City, a giant golden crescent moon on the Makkah Clock Royal Tower in the Abraj Al-Bait complex dominates the scene. By night, when the believers are called to prayer, the cradle of the half moon opens and gliding beams of light climb heavenwards. 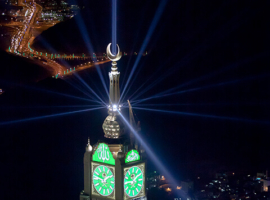 Twenty FALCON STATIC ARC white 7000 watt and twenty-eight SKY FALCON ARC white 1200 searchlights have since the beginning of Ramadan in July 2012 been showing pilgrims the way. For none are more intimately bound to time than Muslims in Mecca. Every year at the time of the Hadj up to three million Muslims make a pilgrimage to the Holy City, which since this summer has seen its stock of lighting equipment lavishly enhanced. The Stuttgart architectural bureau responsible for the project, SL Rasch, went to a great deal of trouble to select the finest lighting equipment for the task in hand and the impressive lighting installation at the top of the Makkah Clock Royal Hotel Tower is therefore the upshot of exhaustive technical discussions and sophisticated lighting demos. With its 601 metres, this is now the second highest building in the world, after the Burj Khalifa. Despite Arabian style elements, the tower bears a remarkable resemble to London’s Big Ben. Even the clocks are among the world’s largest. 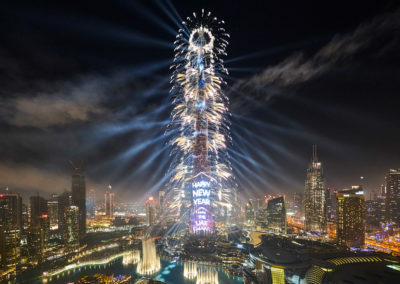 The largest, certainly, ever to have been mounted on a tower, each features a 43-metre-high face, hour-hands 17 metres long and minute-hands measuring 22 metres. And there is one for each point of the compass. In short, the project is on a gigantic scale. For this reason, a correspondingly brilliant and tightly focussed lighting installation was necessary to fully realize the effect. There was just enough space in the half-moon, with its 23-metre diameter, to accommodate the FALCON high-powered searchlights chosen, thereby lessening their exposure to the winds of Saudi Arabia. From the temperatures, however, which can easily reach 50 °C in midsummer and fall below freezing in winter, no shelter was possible. Fortunately the robust FALCON STATIC ARC searchlights are fully capable of withstanding such conditions having already proved their resistance to the elements and extreme conditions on numerous occasions. The A&O FALCON STATIC ARC devices proved the most convincing option for this project but they had to undergo certain modifications. Together with the Stuttgart architects, A&O Technology devised special specifications. 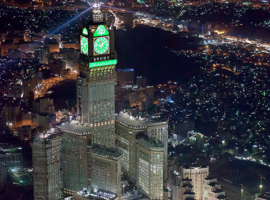 In view of the distance between the control room and the devices, for example, a remote control system had to be integrated into the house network of the Makkah Clock Royal Tower to provide remote supervision of the functions and parameters of the luminaires. Despite the fixed installation, the devices were further equipped with yokes to facilitate carrying, as the customer wished to retain the option of changing configuration scenarios. Special Camlock attachments now hold the mobile devices firmly in place whilst allowing for the possibility that the searchlights might one day be moved to a different location. Since the twenty xenon high-powered searchlights here are installed in a comparatively cramped space, preliminary tests had to be conducted in Bremen to simulate the build-up of heat and airflow. Using heat-sensitive cameras, the technicians were able to simulate and observe the heat development in the kettle-like enclosure of the crescent. Another important modification affected the searchlights’ reflectors. 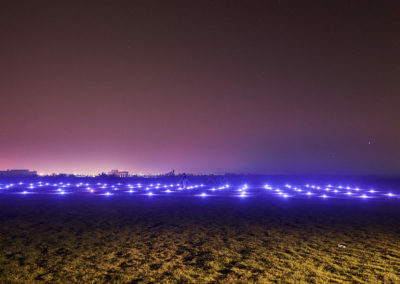 All the FALCON STATIC ARC white devices used on the project were fitted with high-power reflectors, capable of reflecting up to 99% of the visible light. This ensured optimal exploitation of the light. 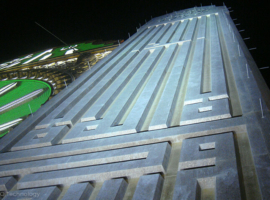 A further twenty-eight SKY FALCON ARC colour 1200 units form part of th installation on the Makkah Clock Royal Tower. Installed on the ledges beneath the giant clocks, these provide homogeneous lighting for the corner pillars. These are covered with numerous decorations and adorn the areas to the left and right of the illuminated clock faces. 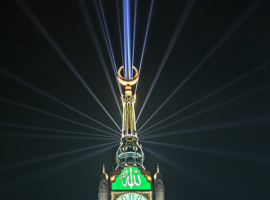 Thanks to the A&O Technology branch in Abu Dhabi, UAE, and its Muslim staff, A&O Technology was in a position to assure both the setting-up and also the onsite supervision of the high-powered searchlights, as traditionally non-Muslims are denied access to the Holy City of Mecca. 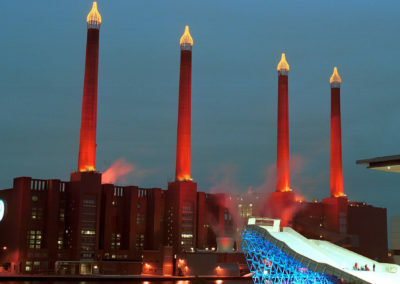 For this reason, A&O Technology provided the technicians in question with detailed preliminary training in the use of the devices purchased at its headquarters in Bremen.